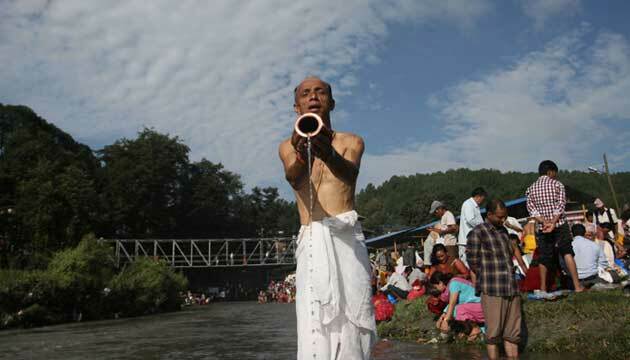 Today is Kushe Aushi in Nepal which is Nepali Father’s day. Kush is a type of holy grass. There is a tradition to bring Kush home on this day of Aunshi (no moon day). Hence, this day is called Kushe Aushi. As I have mentioned in many of my posts before, Nepal has a different calendar than the Gregorian calendar. So in Nepal people also celebrate Father’s day on a different day than the western calendar. 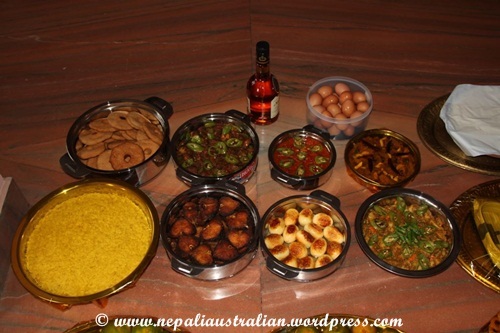 In Australia, Father’s Day is celebrated on the first Sunday of September every year but in Nepali calendar, it changes every year according to the positions of sun, moon and the planets. It falls on the last day of the dark fortnight of August or early September. This year, it happens to be today, 17 August 2012. It is commonly known as Buwa ko Mukh Herne in Nepal which translates into looking at father’s face. As I mentioned in my previous post regarding Mother’s day, this day is very similar to Mother’s day and we cook yummy food for dad. 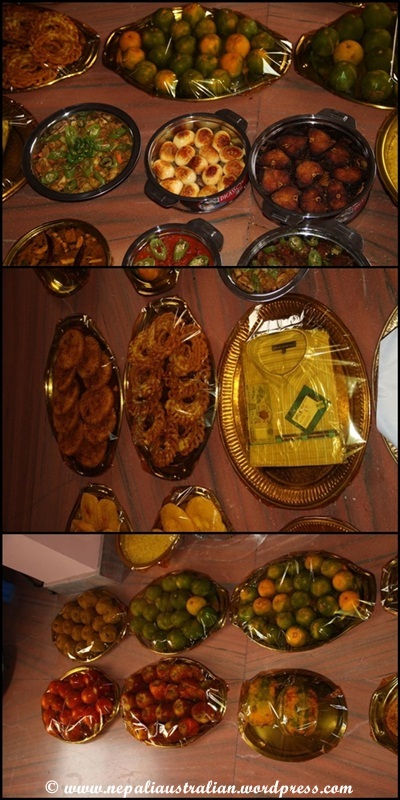 Mostly mum will be do the cooking in reality but we give that to dad :). Like Mother’s day Mum makes Sagun and we give that to dad. Both my parents don’t have their dad anymore so every father’s day they prepare sida daan for a priest. Sida is a holy mixture of rice grains and other pure food materials and a collection of clothes.. They have a shower first thing in the morning and go to the priest’s house to give sida to the priest. During Kuse Aunse Hindus from all over Nepal, whose fathers have passed away descend on Gokarneswar Madadev Temple to worship and take holy dips, and present offerings. They also do Sraddha or pinda daan to their deceased father and some do Shradha at home or at the near river or at any holy place nearby. Mythology has placed the Gokarna shrine from prehistoric times when Lord Shiva hid himself in the Pashupatinath forest, disguised as a one-horned golden deer, from the gods and mankind. While he spent his days frolicking, the world suffered so Lord Vishnu, the preserver, Lord Brahma, the creator and Lord Indra, the king of Gods, took matters into their hands and searched for him. Finally a goddess revealed Shiva’s disguise. So when they finally caught the deer by the horn , it burst into fragments and Shiva revealed himself. He asked the other three gods to establish his horn in their three worlds. So, Vishnu installed his section in his abode in Vaikuntha, Indra in his realm in heaven and Brahma enshrined it at the sacred site of Gokarneshwor. The following day the gods and goddesses descended and bathed in Bagmati river, paid homage to Shiva and established the present day tradition of ancestor worship at Gokarna. 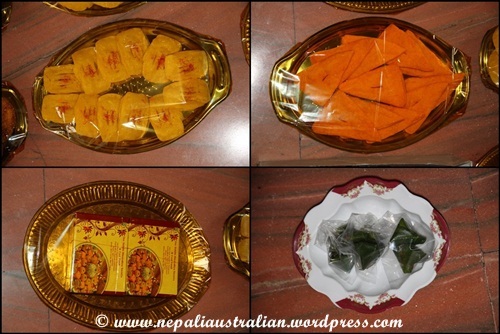 As I have describe in my previous post, in Nepal the first year of marriage is considered to be very important. So during every festival, there are things you are meant to do. 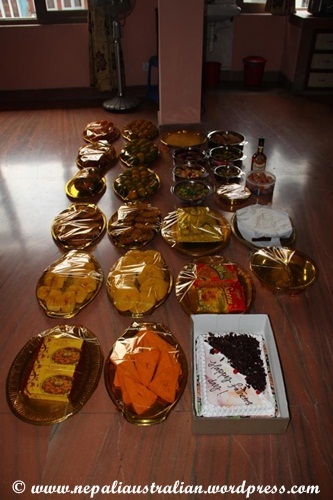 This affects how you celebrate Dashain, Tihar, Father’s Day, Mother’s day and more. Last year, I had my first Father’s day after my wedding and my MIL made sure it was a special one for my dad. Here are some photos from the day. This year I have sent some gifts for my dad already and he will get them today. After work I am going to Skype with him. It is always so nice to see him happy. So if you haven’t called you dad to wish him, do give him a call and make him smile. And to all the proud dads out there, Happy Father’s Day. Here is one of the Father-daughter song form Nepali movie. Hope you will like it. 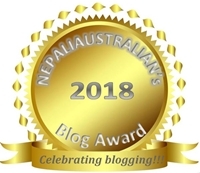 This entry was posted in Family, Nepali Culture, Nepali Festivals and tagged Father's Day, father's day in nepal, holy grass, Kushe Aunsh, Lord shiva, Nepalese Father's Day, nepali father's day, rice grains. Bookmark the permalink. This is why I keep seeing ‘happy father’s day’ on my facebook feed! I was really confused b/c I thought father’s day was in June! 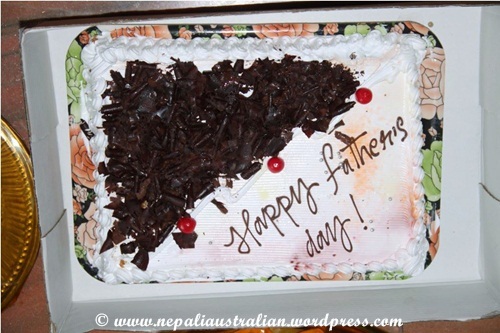 Happy Father’s day to all Nepali dads, and as usual, a nice look at your cultural heritage. Really interesting and educational ! Thanks for sharing !